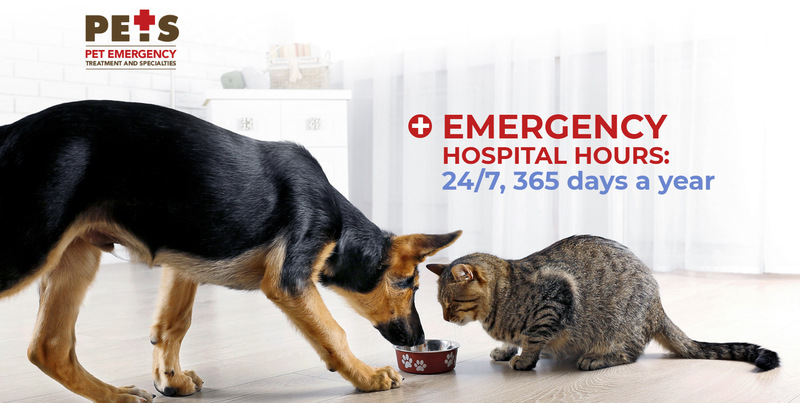 Whether it's the weekend, a holiday or 2AM, pet emergencies rarely happen at a convenient time. Our caring, professional staff is here to help when your regular vet isn't available. Our full-service facility and on-site doctors can handle your pet's illness or injury right away! Our small animal specialists can consult with your regular veterinarian to diagnose and treat a variety of conditions. We have doctors with specialties in cardiology, dermatology, internal medicine, oncology, ophthalmology, radiology and surgical procedures. We provide a complete, in-house diagnostic laboratory, digital x-ray equipment, pharmacy and state-of-the-art facility to provide care for your pet. Our doctors offer compassionate care and are capable of handling any illness or emergency situation. Everyone is so empathetic and understanding. My shi tzu swallowed a plum which can be very poisonous. They were able to get it up whole. Lil gizmo is doing great. Thanks to all of you. "PETS" has a genuine love and passion for all pets. Learning that my dog had cancer, was obviously not something that was easy to hear. But, when it comes to the treatment and care of dogs with cancer, Dr. Clifford is second to none. I would highly recommend PETS to all pet owners! They were really quick and nice. I was expecting to have sticker shock but it didn't matter because my dog needed care. I was so pleasantly surprised with the cost of care. It was much more reasonable than I had built up in my head. The staff was very helpful and the Dr did a great job of explaining our options in a high stress situation. A family member with dementia fed her dog two Advil; when we researched how dangerous Advil is for dogs we rushed him to PETS. They were very professional and helped us immediately, discussing options and outlining a plan of care for King. We are monitoring him now and we’ll do a kidney function test again tomorrow. We are so grateful that PETS is available. Thanks for the rapid response and the help! I can not say enough about the staff here at Pet Emergency Treatment. They are by far the best emergency vet I have ever had to visit. Everyone from the receptionist, to the vet techs, and to the veterinarians that assist us with our rottie this past week. I hope we never have to use them again, but I wouldn’t bat an eye to take one of our dogs there again. Great care and great people. I highly recommend going here. My 2 1/2 year old boxer Piper had a ulcer in her eye that was not healing and required her to see a ophthalmologist. Dr Brady Beale did a great job diagnosing the problem and required Piper to have surgery on her eye. They were able to do it the same day. She did an amazing job fixing her eye and happy to have her back home with us. Could not be happier with the staff in how friendly they were and the amount of care and kindness they showed us. 5 stars hands down. Because we know how difficult it can be to care for an ill pet or say goodbye to one, PETS is pleased to partner with Day By Day Pet Caregiver Support (DBD). This service provides compassionate support to caregivers during the grief that comes before, during and after the loss of a beloved pet. All services are available at NO COST.